St. Anthony the Great or Antony the Great (ca. 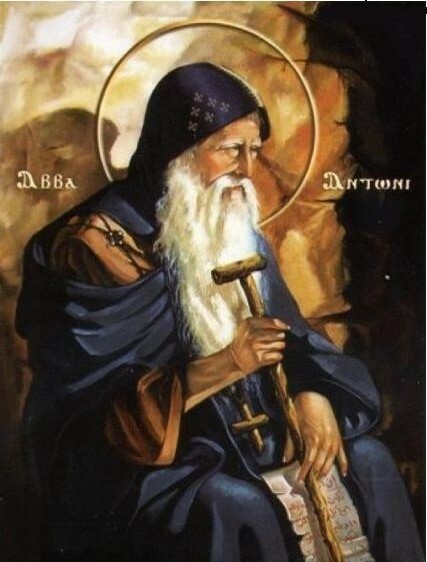 251–356), also known as Saint Anthony, or ‘Anthony of Egypt’, Abba Antonius (Ἀββᾶς Ἀντώνιος), and Father of All Monks, was a Christian saint from Egypt, a prominent leader among the Desert Fathers. The biography of St. Anthony’s life by St. Athanasius of Alexandria helped to spread the concept of monasticism, particularly in Western Europe through Latin translations. He is often erroneously considered the first monk, but as his biography and other sources make clear, there were many ascetics before him. Anthony was, however, the first known ascetic going into the wilderness (about A.D. 270–271), a geographical move that seems to have contributed to his renown. Accounts of Anthony enduring supernatural temptation during his sojourn in the Libyan Desert inspired the often-repeated subject of the temptation of St. Anthony in Western art and literature. Life – Early life : Most of what is known about Saint Anthony comes from the Life of Anthony. Written in Greek around 360 by Athanasius of Alexandria, it depicts Anthony as an illiterate and holy man who through his existence in a primordial landscape has an absolute connection to the divine truth, which always is in harmony with that of Athanasius as the biographer. Sometime before 374, it was translated into Latin by Evagrius of Antioch. The Latin translation helped the Life become one of the best known works of literature in the Christian world, a status it would hold through the Middle Ages. In addition to the Life, several surviving homilies and epistles of varying authenticity provide some additional autobiographical detail. Anthony was born in Coma (or Koma) near Herakleopolis Magna in Lower Egypt in 251 to wealthy landowner parents. When he was about 18 years old, his parents died and left him with the care of his unmarried sister. Shortly thereafter, he decided to follow the words of Jesus, who had said: “If you want to be perfect, go, sell what you have and give to the poor, and you will have treasures in heaven; and come, follow Me.”,[Mt 19:21] which is part of the Evangelical counsels. Taking these words quite literally, Anthony gave away some of the family estate to his neighbors, sold the remaining property, donated the funds thus raised to the poor, placed his sister with a group of Christian virgins, a sort of proto-monastery of nuns, and himself became the disciple of a local hermit. The appellation “Father of Monasticism” might be considered misleading, as Christian monasticism was already being practiced in the deserts of Egypt. Ascetics commonly retired to isolated locations on the outskirts of cities. By the 2nd century there were also famous Christian ascetics, such as Saint Thecla. There are various legends associating him with pigs: one is that for a time he worked as a swineherd. Hermit : Saint Anthony decided to follow this tradition and headed out into the alkaline Nitrian Desert region (which became the location of the noted monasteries of Nitria, Kellia and Scetis), about 95 km (59 mi) west of Alexandria, on the edge of the Western Desert. Here he remained for some 13 years. Anthony is notable for being one of the first ascetics to attempt living in the desert proper, completely cut off from civilization. His anchoretic lifestyle was remarkably harsher than that of his predecessors. Yet the title of Father of monasticism is merited as he was the inspiration for the coming of hundreds of men and women into the depths of the desert, who were then loosely organized into small communities, especially by his disciple, Macarius. According to Athanasius, the devil fought St. Anthony by afflicting him with boredom, laziness, and the phantoms of women, which he overcame by the power of prayer, providing a theme for Christian art. After that, he moved to a tomb, where he resided and closed the door on himself, depending on some local villagers who brought him food. When the devil perceived his ascetic life and his intense worship, he was envious and beat him mercilessly, leaving him unconscious. When his friends from the local village came to visit him and found him in this condition, they carried him to a church. After he recovered, he made a second effort and went back into the desert to a farther mountain by the Nile called Pispir, now Der el Memun, opposite Crocodilopolis. There he lived strictly enclosed in an old abandoned Roman fort for some twenty years. According to Athanasius, the devil again resumed his war against Saint Anthony, only this time the phantoms were in the form of wild beasts, wolves, lions, snakes and scorpions. They appeared as if they were about to attack him or cut him into pieces. But the saint would laugh at them scornfully and say, “If any of you have any authority over me, only one would have been sufficient to fight me.” At his saying this, they disappeared as though in smoke. This is attributed as a victory granted by God. While in the fort he only communicated with the outside world by a crevice through which food would be passed and he would say a few words. Saint Anthony would prepare a quantity of bread that would sustain him for six months. He did not allow anyone to enter his cell; whoever came to him stood outside and listened to his advice. Then one day he emerged from the fort with the help of villagers to break down the door. By this time most had expected him to have wasted away, or to have gone insane in his solitary confinement. Instead, he emerged healthy, serene and enlightened. Everyone was amazed that he had been through these trials and emerged spiritually rejuvenated. He was hailed as a hero and from this time forth the legend of Anthony began to spread and grow. Anthony went to the Fayyum and confirmed the brethren there in the Christian faith, then returned to his old Roman fort. In 311, Anthony wished to become a martyr and went to Alexandria. He visited those who were imprisoned for the sake of Christ and comforted them. When the Governor saw that he was confessing his Christianity publicly, not caring what might happen to him, he ordered him not to show up in the city. However, the Saint did not heed his threats. He faced him and argued with him in order that he might arouse his anger so that he might be tortured and martyred, but it did not happen. Father of monks : He left Alexandria to return to the old Roman fort upon the end of the persecutions. Here, many came to visit him and to hear his teachings. He saw that these visits kept him away from his worship. As a result, he went further into the Eastern Desert of Egypt. He travelled to the inner wilderness for three days, until he found a spring of water and some palm trees, and then he chose to settle there. Disciples soon started to come to him to seek spiritual teaching. A trickle became a flood, and soon they numbered in the hundreds. On this spot now stands the monastery of Saint Anthony the Great. There, he anticipated the rule of Benedict of Nursia who lived about 200 years later; “pray and work”, by engaging himself and his disciple or disciples in manual labor. Anthony himself cultivated a garden and wove mats of rushes. He and his disciples were regularly sought out for words of enlightenment. These statements were later collected into the book of Sayings of the Desert Fathers. Anthony himself is said to have spoken to those of a spiritual disposition personally, leaving the task of addressing the more worldly visitors to Macarius. On occasions, he would go to the monastery on the outskirts of the desert by the Nile to visit the brethren, then return to his inner monastery. The backstory of one of the surviving epistles, directed to Constantine I, recounts how the fame of Saint Anthony spread abroad and reached Emperor Constantine. The Emperor wrote to him offering him praise and asking him to pray for him. The brethren were pleased with the Emperor’s letter, but Anthony did not pay any attention to it, and he said to them, “The books of God, the King of Kings and the Lord of Lords, commands us every day, but we do not heed what they tell us, and we turn our backs on them.” Under the persistence of the brethren who told him, “Emperor Constantine loves the church,” he accepted to write him a letter blessing him, and praying for the peace and safety of the empire and the church. According to Athanasius, Saint Anthony heard a voice telling him, “Go out and see.” He went out and saw an angel who wore a girdle with a cross, one resembling the holy Eskiem (Tonsure or Schema), and on his head was a head cover (Kolansowa). He was sitting while braiding palm leaves, then he stood up to pray, and again he sat to weave. A voice came to him saying, “Anthony, do this and you will rest.” Henceforth, he started to wear this tunic that he saw, and began to weave palm leaves, and never was bored again. Saint Anthony prophesied about the persecution that was about to happen to the church and the control of the heretics over it, the church victory and its return to its former glory, and the end of the age. When Saint Macarius visited Saint Anthony, Saint Anthony clothed him with the monk’s garb, and foretold him what would be of him. When the day drew near of the departure of Saint Paul the First Hermit in the desert, Saint Anthony went to him and buried him, after clothing him in a tunic which was a present from St Athanasius the Apostolic, the 20th Patriarch of Alexandria. In 338, he was summoned by Athanasius of Alexandria to help refute the teachings of Arius. Final days : When Saint Anthony felt that the day of his departure had approached, he commanded his disciples to give his staff to Saint Macarius, and to give one sheepskin cloak to Saint Athanasius and the other sheepskin cloak to Saint Serapion, his disciple. He further instructed his disciples to bury his body in an unmarked, secret grave. He probably spoke only his native language, Coptic, but his sayings were spread in a Greek translation. He himself left no writings. His biography was written by Saint Athanasius and titled Life of Saint Anthony the Great. Many stories are also told about him in various collections of sayings of the Desert Fathers. Temptation : Famously, Anthony is said to have faced a series of supernatural temptations during his pilgrimage to the desert. The first to report on the temptation was his contemporary Athanasius of Alexandria. However, some modern scholars have argued that the demons and temptations that Anthony is reported to have faced may have been related to Athanasius by some of the simpler pilgrims who had visited him, who may have been conveying what they had been told in a manner more dramatic than it had been conveyed to them. The satyr and the centaur : Saint Anthony was on a journey in the desert to find his predecessor, Saint Paul of Thebes. Saint Anthony had been under the impression that he was the first person to ever dwell in the desert; however, due to a vision, Saint Anthony was called into the desert to find his predecessor, Saint Paul. On his way there he ran into two demons in the forms of a centaur and a satyr. Many works of art depict Saint Anthony meeting with this centaur and satyr. Western theology considers these demons to have been temptations. At any rate, he was stopped by these demons and asked, “Who are you?” To that the satyr replied, “I am a corpse, one of those whom the heathen calls satyrs, and by them were snared into idolatry.” The satyr then tried to terrify the saint while the centaur acknowledged the overthrow of the gods. In the end, the centaur tried to show Saint Anthony the way to his destination while the satyr ended up asking for Saint Anthony’s blessing. Veneration : Anthony was secretly buried on the mountain-top where he had chosen to live. His remains were reportedly discovered in 361, and transferred to Alexandria. Some time later, they were taken from Alexandria to Constantinople, so that they might escape the destruction being perpetrated by invading Saracens. Later, in the eleventh century, the Byzantine emperor gave them to the French Count Jocelin. Jocelin had them transferred to La-Motte-Saint-Didier, which was then renamed Saint-Antoine-en-Dauphiné. Veneration of Anthony in the East is more restrained. He is regarded as the “first master of the desert and the pinnacle of holy monks”.